Yeah, I know. I'll give you a second to recover from the cuteness overload. 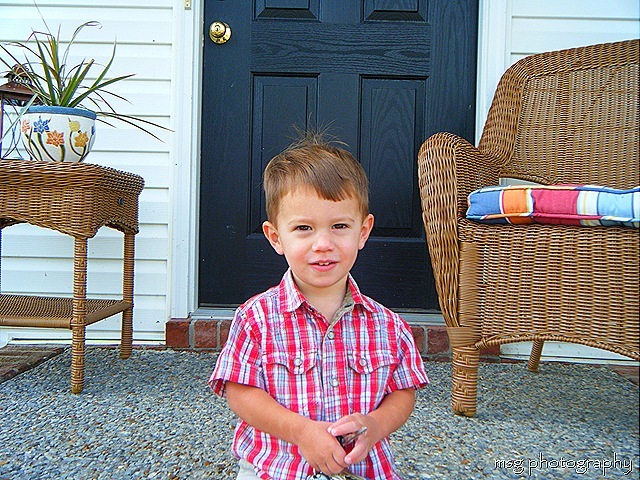 This was Seth's first day of "preschool" (aka Mother's Day Out) in August 2009. And I blinked, literally, and here I sit, on the eve of his first day of kindergarten. I'm not overly emotional. I have mommy-friends all around me who are bombarding Facebook with (forgive me) ultra-sappy e-cards and plagiarized poems about fleeting years and holding back tears as little ones board yellow busses for the first time. Seth is beyond ready for the independence that comes tomorrow morning with the bus and the lunch room and the table time and the card behavior system. He is ready with a capital R. And so am I. I'm not a good teacher. There is a reason I studied journalism, not early childhood education. These are HARD years to muddle through. (Trust me; I'm still in the trenches.) They are not my favorite. So, on many days, I'm just "OMG get out of the house and go learn forgoodnesssake already!!!" I can say that, with total honesty, and in the same breath, sit back and analyze and realize that I feel like I failed him in some way. That I was selfish with my time, and that I didn't make the most of the handful -- literal handful -- of years that I had him all to myself, under my roof, to mold and shape and teach and love. I didn't wish the years away. I just feel, in this moment, that I could have done better. I could have been more intentional. More influential. More....well, just more. And I guess that is the plight of the firstborn. They are our learning curve. Our test run. Our "oh, please just don't let me screw him up too badly" one. But. Despite my shortcomings, he is ready. He is tucked in bed, Bailey under one arm, awash in the glow of a green lava lamp. And for just one more night, he is just my baby. Dude. I love you, but... No, no, noooo, goodness no! You didnt even come close to failing him, not in the least bit. Monica, you are an AMAZING momma. And YOU are the one who has made him ready with a capital R for the Big K. He is going to be great; everyone knows that. And it is because he IS great, and you are the one who has made him that way. And for the record, I think you are an amazing teacher. Tomorrow when he gets on the bus and you watch it pull away, just think to yourself... Victory. 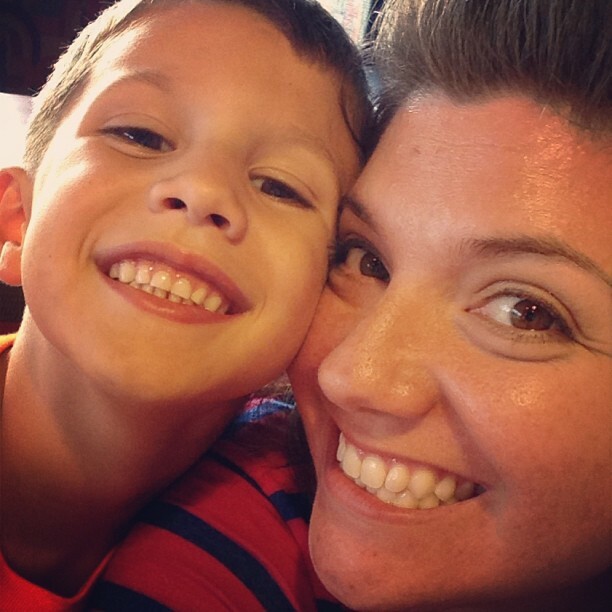 Cause you have raised an awesome kid who is about to rock his first year of grade school. You're doing an amazing job and I'm so thankful that I get to learn from you. Beautiful sentiments, simply beautiful. They capture the reality of parenting a firstborn (especially for those of us who don't have the gift of teaching). So many nights I find peace knowing our Heavenly Father covers the gaps of my daily shortcomings. You summed it up beautifully--I have the SAME feelings on the early childhood stuff and my firstborn starts kinder next Monday and I've found myself wrestling with the same stuff. Thanks for putting it in words.